Edwin "Nicky" George Nickerson Sr.
Edwin “Nicky” George Nickerson Sr. passed away August 27, 2018 surrounded by his loving family. He was born September 13, 1934 in Merrill, ME to Darius and Fern (Graham) Nickerson. Nicky graduated from high school and also took some college courses. 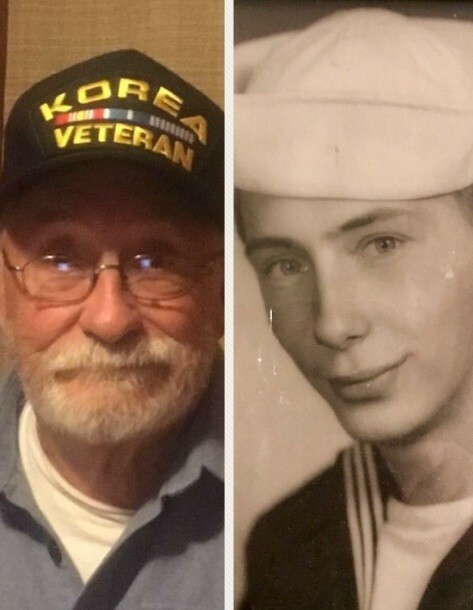 He served our country as a member of the United States Navy from 1951-55 during the Korean War. He was a long time Supervisor at the Reece Corporation in Gorham, ME and then Richmond, VA. He married Marilyn Rowland on December 3, 1955 in Westbrook, ME. Nicky was “a loveable curmudgeon” who adored his wife and family. He got so much enjoyment out of spending time with all four generations as the grandchildren and great-grandchildren were always sure to put a smile on his face. He was at his happiest sitting in his recliner watching either the Red Sox or Patriots with his wife and a dog on his lap. He enjoyed golfing, bowling, playing horseshoes and in his earlier years snowmobiling. Nicky was preceded in death by his parents and three nephews. He is survived by: his wife of almost 64 years, Marilyn Nickerson; daughter, Robin Wallace and her husband Bob; son, Edwin Nickerson Jr. and his wife Kelly; sisters, Joanne Snow and her husband Roger and Judith Troiano; grandsons, Paul Hansen and his wife Danielle, Dylan Fritz-Nickerson and his husband Nathan, and Edwin Nickerson III; granddaughters, Nichole Culllen and her husband Jeff and Abigail Nickerson; great-granddaughters, Bebe Cullen and Lucy Hansen; and great-grandson, Chance Hansen. In lieu of flowers donations may be made in Nicky’s name to the Animal Refuge League of Greater Portland, P.O. Box 336, Westbrook, ME 04098 or arlgp.org. Visitation will take place from 11:00 AM – 12:00 PM on Tuesday, September 4, 2018 followed by a memorial service at 12:00 PM at A.T. Hutchins Funeral Home, 660 Brighton Ave., Portland. Interment will be at Brooklawn Memorial Park followed by a reception at A.T. Hutchins.